Galley Support Innovations | We Make It Happen! 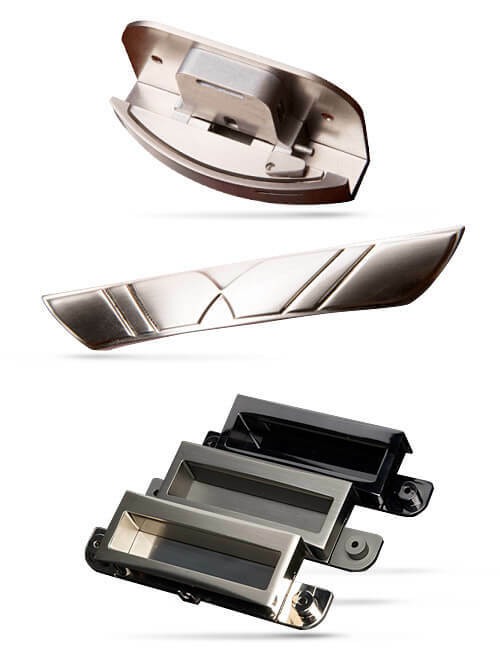 Galley Support Innovations is the leading designer and manufacturer of interior hardware. 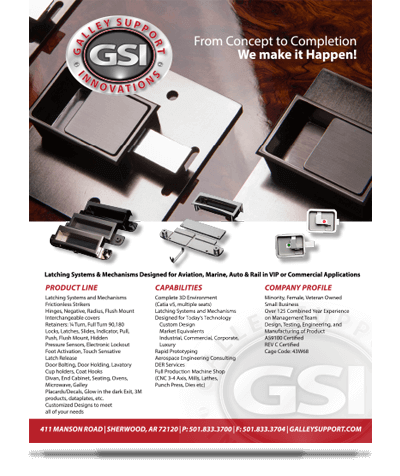 GSI specializes in aircraft interior hardware such as; Galley Latches, Galley Hardware, Quarter Turn Retainers, Door Bolting Systems, Ashtrays, Cup Holders, Coat Hooks, Slam Latches, Push Button Latches, Hinges, Strikers, Adjustable Strikers, Striker Pusher Combos, and the latest and greatest in latching innovations including the patent pending Hidden Latch, and electro-mechanical lathes among others. From conception to completion, industrial to luxury, we do it all. GSI is a family owned and operated business with a full and rich history dating back over 60 years. We offer a world of possibilities with options ranging from our foundation of core products and their thousands of variations, to our one of a kind – custom designed products made to encompass the customer’s needs, wants, and visions. We use our expertise in designing and manufacturing to develop products for industries such as; Aviation, Marine, Rail, and Private Transportation. Our products our compatible for every application and industry. No job is too big or small. Our AS9100 Quality Management System ensures only the highest quality parts are delivered to our customers with every shipment. GSI’s Quality Management System is one way we maintain our zero-defect culture throughout our entire organization. Whether the request is to manufacture to print or develop an original design, our engineering team, precision machine shop, and production facilities provide a product that exceeds industry standards every time.